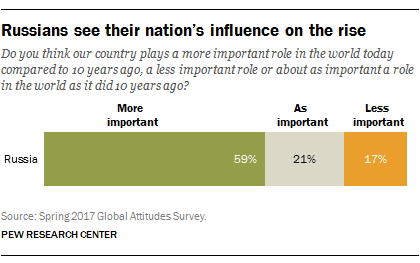 1 A majority of Russians believe their country is playing a more important role in the world today than it did a decade ago. Other publics with a sense of growing global importance include China and India. In a spring 2016 survey, three-quarters of Chinese and 68% of Indians said their country is more influential compared with a decade ago. Such confidence contrasts with European views, where a median of just 23% across 10 European Union nations felt their country’s global influence was on the rise in 2016. 2Most Russians still believe their country doesn’t get the respect it deserves, but fewer feel this way now than in the past. Today, 56% of the Russian public thinks Moscow should be held in higher esteem around the world. About a third believes Russia gets the proper amount of respect, which is up from just 16% in 2012, the last time the question was asked. 3 Many Russians see inherent conflict in their relationship with the West, but few rule out cooperation. According to a recently released Pew Research Center report based on 2015 survey data, overwhelming majorities in Russia believe that their country serves as an important counterbalance to the West (85%) and that Russian values clash with Western values (73%). However, Russians remain open to cooperation with the U.S. and other Western nations. A majority (55%) agree it is in their nation’s interest to work closely with the West. 4 Russian President Vladimir Putin gets high marks on foreign affairs. Overall, nearly nine-in-ten Russians say they are confident in their president’s ability to do the right thing in world affairs, with 58% expressing a lot of confidence. When it comes to bilateral relationships, Russians give Putin high ratings on his handling of relations with the U.S. (73% approve), the EU (67%) and Ukraine (63%). But these ratings are down substantially from 2015, when 85% approved of Putin’s handling of the U.S., 82% approved of EU relations and 83% approved of Ukrainian relations. Putin gets his highest marks on managing relations with China (78% approval), a country with which Russian relations have become markedly friendlier in recent years. However, even that figure is down 12 percentage points compared with 2015.